Use Trimble® Contractor for your construction business and minimize the hassle and piles of paperwork required for ensuring payment and managing expenses. 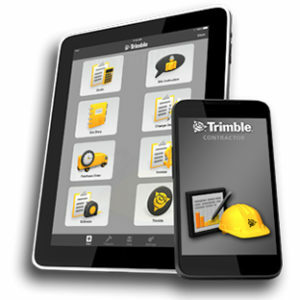 With Trimble Contractor you can automate processes and manage common office tasks out in the field using a smartphone or tablet. The data you collect using this affordable software can be exported into your current accounting software as well. With Trimble Contractor you can quickly send and receive approval on quotes, plus you will always have them with you for improved communications with your customers. Trimble Contractor allows you to create quotes directly from a customized price or item list, send the quotes to customers via email and stores them on your device as well. Notes, sketches and photos can also be attached. Quickly identify potential problems by using Trimble Contractor to monitor project progress on a daily basis. You can track daily activities while on site and check the job site’s progress against quotes. Trimble Contractor also offers you a digital timesheet. Trimble Contractor makes project accounting easier, too. With it you can accurately track material charges and compare them against quotes. You can also charge for changes or variations – Trimble Contractor helps document proof for the change order. Trimble Contractor can also be used to create invoices directly from quotes so you can send invoices and track project and payment status. By creating and sending employees site instructions from Trimble Contractor, you can ensure your crews are working on the right projects at the right times.